As one of the premier abstract artists of the 20th century, Martin continues to create deeply engaging and moving pictures. Her recent paintings of the 1990s vary from her earlier works in two significant ways. Since moving to her current home in Taos in 1993, she reduced the scale of her signature 72 x 72 square paintings to 60 x 60 inches, which produces an altogether different visual affect. The 1990s paintings play with the tension between the viewer's understanding of the painting as an image to behold on the wall versus the desire to comprehend the painting as a doorway to enter an "ethereal realm". The second departure is a modification of the grid structure Martin has used since the late 1950s. In the present picture, Untitled No. 4, one views the gentle striations of pencil line and primary color washes of diluted acrylic paint blended with gesso. It is an image of living perfection; the touch of the artist is evident in the way the lines meet or sometimes not meet the sides of the canvas, creating a visual swelling of form in the middle of the painting, thus an image of plentitude and expansion. The lines are not measured by a ruler, but rather, intuitively marked by the artist. "For more than five decades, Martin has created paintings that are evocations of light, each an individual issuance of ethereal rhythms. Simultaneously powerful and gentle, they are spartan works, beautiful without the slightest adornment. The paintings that Martin has offered us with unstinting consistency are pictures of anything. They are cadences of light, form, and color. You can "hear" them with your eyes. They are silent sounds. 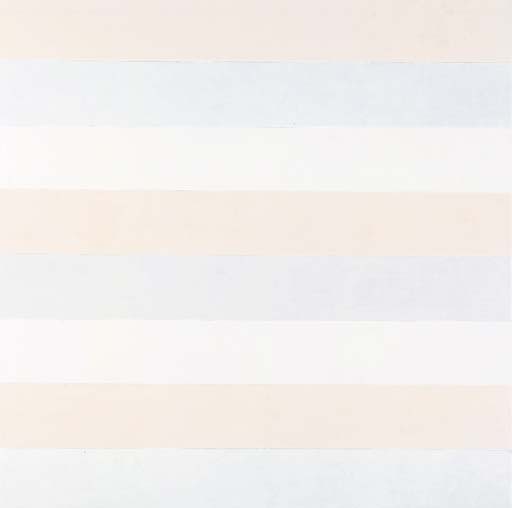 (N. Rifkin, Agnes Martin: The Nineties and Beyond, exh. cat., 2002, p. 28).